She probably had a point, although, to be fair, I did produce a fair quantity of work. All of these tools are now probably waiting for a grandchild to express an interest. I don’t think I could bear to part with them otherwise. Unless you have an offer in mind. When I took up painting, I simply switched my allegiance from tool shops to art supply houses. Not knowing any better, I bought numerous inexpensive brushes of various sizes, mainly quite small, and a number of different palettes. As to paint and paper, I bought whatever was on sale. When I check my inventory now, I can count about 40 brushes, 8 palettes (one of which I actually sold, then wished I hadn’t), a wide range of DaVinci tube paints, with a few Winsor&Newton and Holbein special colours, and an entire panoply of supporting equipment. Among the latter is a lighting equipment set-up for photographing my work, a brand new SLR camera ditto, a Logan mat cutter, tripod with plein air support, backpack with built-in stool, shelves of frames and matboard and a substantial supply of quality paper. Did I mention books and DVDs? And then there’s the acrylic supplies that I haven’t really got started on. 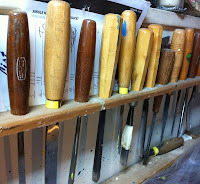 As with the carving tools, I really only use about 6 or 8 of the brushes that I own. Of course, this is the result of learning on the go. Many of the brushes I bought are either too specialized (e.g. : a fan brush!) or really of poor quality. I had to swallow hard when I bought my first brush worth over $50 – a 1.5-inch Robert Simmons flat – but what a delight to use. The same with my two round sables from AboveGround – excellent value, incidentally. What’s next? Well, three of my favourite painters swear by the Davinci Mops made from Russian blue squirrel hair. So stay tuned. In my next post, I'll ruminate on specific pieces of equipment.